Hollybeary Creations : NND January Sneaks Day 3! NND January Sneaks Day 3! 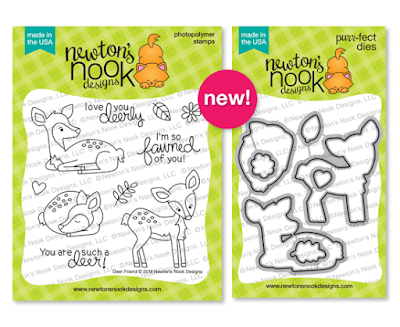 It's Day three of the Newton's Nook January Release Sneaks and today we are sharing an Adorable new set called... Deer Friend and it's coordinating dies. I love the images in this set and the sentiment are just as cute as the images!! I started by die-cutting a piece of pattern paper using the Frames and Flags Die set. Then I adhered the panel to a Black top folding card base. I stamped the sentiment onto some Black card stock and embossed it in White. Then I die cut the piece with the banner in the Frames and Flags Die set as well. I adhered it in the corner with some foam tape. I stamped a line of trees from the Whispering Pines stamp set using two shades of Green ink onto White card stock. Then I used a B Copic marker to add a sky, leaving the ground white like snow. Then I added a Black scalloped Circle frame and adhered it to the card front with foam tape. I stamped the Deer image onto some X-press it blending cardstock and colored her in with Copics. Then I used the coordinating dies to cut it out and adhered it inside the circle with some foam tape. I added a little shadow with a C00 Copic marker where she is standing. The background paper creates such a crisp look for the gorgeous winter scene! Love this! oh how adrable is this card! Winter scene is such a fantastic idea!!! Love this darling card!!! I love this card. The coloring is great. Thank you for sharing! Such a pretty card. Ilove that you gathered it with the pine trees! Such a cute card! I love the stamped trees behind the image. This card is so sweet! I love how you combined stamp sets to give the deer trees to stand in front of as scenery. you used as a BG - fits perfectly with the deer & sentiment. Cute scene and sentiment and I like the paper you used. This dear set is so darn cute! Love it! Fawnly a set I can use all year round! 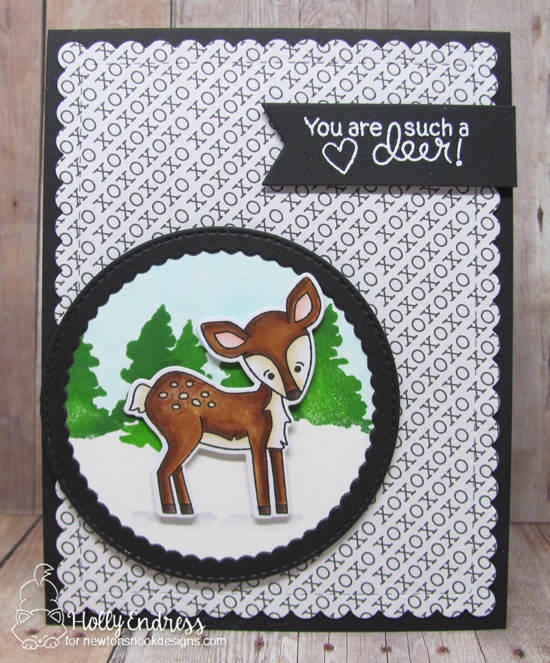 I love the scalloped borders, the XO background and your trees keeping that sweetly colored deer company! Great use of patterned paper behind. I often forget to try and use my patterned paper, but this works perfectly to highlight that adorable little deer. Thanks for sharing! Cute little scene... great layout. The pattern paper draws you in. The black and white background really makes the deer and trees pop! Totally adorable! This is such an awesome release! Your card is super cute! Love the layering and coloring! Adorable card! The deer is so sweet, and love the scene you created as a setting! Great card. Olive your background and how it makes the deer standout. 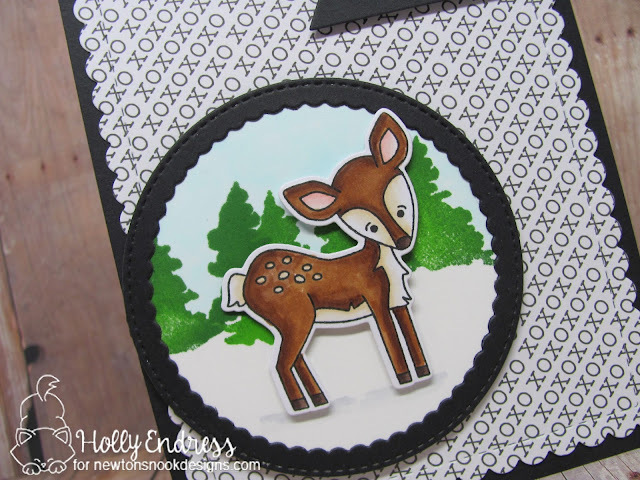 Love how you framed the deer - Really makes him just pop off the card! Very striking! Fantastic card! I love the XO background paper! The winter scene is a great idea!!! This little deer is such a sweet creature !